The 2012 CES show floor covered almost two million square feet of exhibit space, more than thirty-seven football fields, all filled with consumer technology innovation. The 3,100 companies showcased over twenty thousand products from Handheld devices and every accessory available to streamline the user experience to business technologies guaranteed to assistant your humanoid employee reach their maximum output to personal appliance robots, creating more convenience and freedom for the consumer. CES is the only destination for all things tech, from personal to business to green, and this year was no different with most major corporations in attendance announcing product launches, roll-outs, and partnerships during the week long tradeshow. Microsoft CEO Steve Ballmer delivered the biggest surprise during his keynote as he announced CES 2012 will be the last year Microsoft attends the tradeshow and plans to roll out new products lines and launches at their own pace. Microsoft’s innovation for CES 2012 focused on the Ultrabook tablets, Windows 8, an upgrade on the number one personal and business software in the world, and Windows Phone. LG Electronics, the SMART Technology home appliance innovator unveiled several new products designed to maximize energy efficiency and ease of use and remove the need for constant human involvement! Smart Home appliances, always a big item at CES, are, in actuality, energy efficient appliances as the user experience is still an intimate part of most home appliances: A requirement LG plans to change! From the new TrueSteam Dishwasher that virtually eliminates pre-washing to the motorized canister vacuum and new robotic vacuum, which does away with constant human interaction, LG Electronics have continued to raise the bar on Smart Appliances and personal home electronics. Other major innovations during the 2012 CES were in the Automotive Sector. Among the many deals and partnerships announced during the event General Motors (GM) and Onstar held a joint press conference demonstrating technologies designed to assist the user experience. Onstar FMV, a revolutionary device in the 4G/LT cloud experience that provides instant GPS assistance to the rear view mirror and GM’s, CUE, Cadillac User Experience, is designed to create the ultimate automotive luxury user experience coupled with the ultimate technology experience. 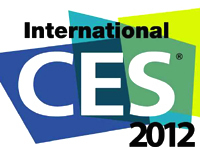 With over three thousand companies in attendance CES 2012 previewed the best and most technological innovation available on the planet.